Warratahstree Art and Creative Inspiration: G.R.I.T.S. I am planning a series of posts in April about my very first experience with a Market stall. 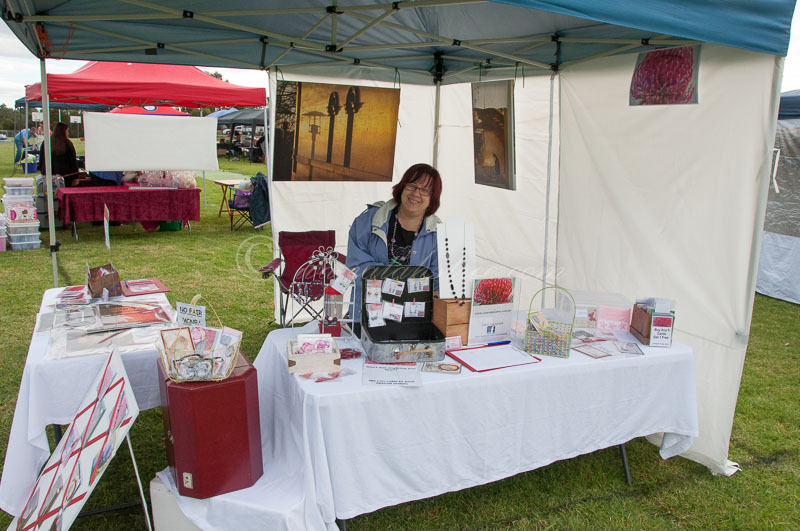 Before, I start the blog posts on market stalls, I thought maybe I should introduce myself and give a bit of background about where I came from and how I got to this new venture of mine in selling my art, photography and handmade items. First, why G.R.I.T.S.? The acronym comes from the book "Grits (Girls Raised in the South) Guide to Life" by Deborah Ford. I found this book while on one of my travels back to my home state of NC, USA. This book is a great read. Grits also happens to be my favorite breakfast food. So, now you know I am a GRITS, but I have lived in Australia for 29 years. I often miss the food I grew up on, NC BBQ being the all time favorite and grits. Until recently, when I moved to Melbourne, VIC Australia, 5 years ago, I could not buy grits, Fritos, Diet Dr Pepper, Diet Root Beer, and the list goes on. When you have lived in another country as long as I have you sometimes feel like you are torn between where you were raised, and where you live. I am neither an Aussie nor an American anymore, I am a mixture of both. It all depends on the day and how homesick for my birth country I am. When you eaten the different food in that country, studied in that different country, raised children in that different country, and worked in that different country for more than half your life the lines between who you are and where you were born become blurred. I love a lot of things about living in Australia. It is a beautiful country. I studied as a Geologist here in Australia and fell in love with the beauty of the country side (it's called 'bush' here). However, every time I go home to the mountains and country side of NC, USA, my heart feels like it is divided. I am divided between the country of my birth and the adopted country I now live in. Enough about who Tracy @ warratahstree is, now to how did I start this new adventure into the handmade items, photography and art. I have always done some form of craft since I was very young, sewing, knitting, crocheting, and my favorite embroidery. I remember making all my clothes until I left home at 18 years old. While I was studying Geology, in South Australia, I fell in love with the bush and the beautiful animals and flowers of the bush in Australia. I am also an avid 'rock licker" as one person called me. A Geologist was called a 'rock licker' because to see the small grains in a rock it is best done while the rock is wet. So, most geologist will pick up a rock and lick it to taste the rock (yes they have a different taste for different types of rocks) and to see the grains in the rock. Every Geology trip I did in university, I would get my husband to take me back to that place and take loads of photos. I was not good at photography then and my photos always came out blurry (before digital cameras). All throughout this time, I always wanted to be able to draw these images of the rock formations, the surrounding trees, flowers and environment. It was all very inspiring, but I could not draw very well. Sure I could draw contours, draw the rock formations (sort of) and striations, but my best effort of drawing anything was stick people. I wanted to be able to paint and draw the flowers too but had no art background. I was a scientist, left brain thinking but right brain wanta be. When I graduated from university it took a while to find a job and I was a bit bored. Someone told me about a "Folkart" group and that I did not need to know how to draw to learn how to paint. BINGO! Finally, after years of pushing back that right brain creativity and wanting to learn to paint, I had an outlet. I started going to Folkart classes and after a few years I stumbled on a painter that painted all Australian Native Flora and Fauna. That was it I was hooked, and my favorite flower to paint was the Warratah. The Waratah is a native flower to NSW, Australia, the state where Sydney is for all you not familiar with Australia. 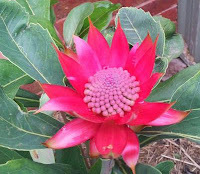 The waratah is a big bright, red flower. For a long time every piece I painted had to have Australian Flowers or animals on it with many pieces featuring the waratah. When my son's were in the Scout's my husband and I were asked to be Scout leaders. I needed a nick name as the kids were not allowed to call us by our first names. So, I chose Warratah. From the beginning, being slightly dyslexic, I spelled waratah with 2 r's. The nickname stuck and I used the nickname warratah online as well. When I was part of a Christian online chat group, someone would call me "war", short for warratah. That is when I started calling myself "Warratahstree". After all, the flower of the waratah grows on a tree. Actually, the waratah can be of varying sizes but the one I painted most often and I also have a waratah tree is the Telopea speciosissim. One of my paintings of a waratah is below. 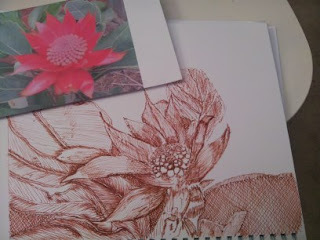 Here is a drawing I did of the waratah in my garden. Last year I took time off work to recover from over work, stress and sleep deprived induced from a job that flared up my fibromyalgia the worst it had ever been in 10 years! I had always wanted to take my art and my love of making cards to another level and sell some of my work. I have been selling my Christmas cards to a group of ladies every year for several years. I was also making my own Fimo jewelry beads. So, while I was taking time off work, I decided to make a go at selling online and maybe try selling at craft markets as well. So, Warratahstree, my nickname for nearly 10 years became my business name. I have done a course on writing your own business plan, business plan started and a work in progress. I have done some research on what I wanted my products to be and in the progress of uploading them onto my Etsy shop. I have researched quite a few markets here in the Melbourne area and I love to go to markets of all kinds. I have done my first ever Market stall and I plan to do others. So, here we are. The birth of a new small business and hopefully a long and successful business of online and market stall selling. My next posts are going to be on the Market Stall experience. I'm returning your visit. I love the G.R.I.T.S. it is awesome. I'm also your newest follower. Your blog is great. I will visit often. I have a weekend link party every week from Thursday through Sunday. I'd love to have you come by and link up a post or whatever you like. No requirements other than family friendly. Hope to see you there. Thank you. I am so glad you liked my G.R.I.T.S. I had a lot of fun writing it and am enjoying blog hops and link ups. I will be there and will add ti to my linky party page. I am glad you liked my post. Come back soon. Visiting from the Good Friday hop, now following via GFC. Hi Tracy! I love your story! I am a North Carolina girl too. Thanks for following! I'm following back! Hey Tracy. What a wonderful introduction. Wishing you much success. Hey Tracy. Welcome back to the USA! I know, I feel the same way you do. I lived in Mississippi all these years and now for 5 years have been in Tennessee. It's just not home. Love your pictures. Thanks for stopping by and following my site. Have a great Easter. I hope your market stall went really well! I love the photo of the pincushion protea. Beautiful! I am glad you like the picture of the 'pincushion protea'. I is a native flower to Australia in NSW. It is my favorite to paint and draw. The drawing is in it's early blooming stage. Hi, linking up from the Meet & Greet blog hop. I admire you for taking care of yourself which seems to have opened up a door for you. I have checked out your Etsy shop, very nice. I'm a pinaholic so I will pin some of your items for sure. In some of my research, I have been told, seen on other blogs etc...It is not what you like to make sometimes but a balance between what customers will buy and what you have a passion to make. Sometimes no matter what you are making it is a compromise between what you like and what people will buy. Good idea for a post...As I am posting on the research I did/am doing before I did my first market stall, I might add this as a blog post this week. I was amazed at how beautiful your drawing of warratah. It's beautiful. I am glad you liked my drawing of the waratah. It was growing in my garden till this last hot spell we had here and it just died before we realised it did not like the really hot direct sun :(. I will see you on Pin It Monday hop.